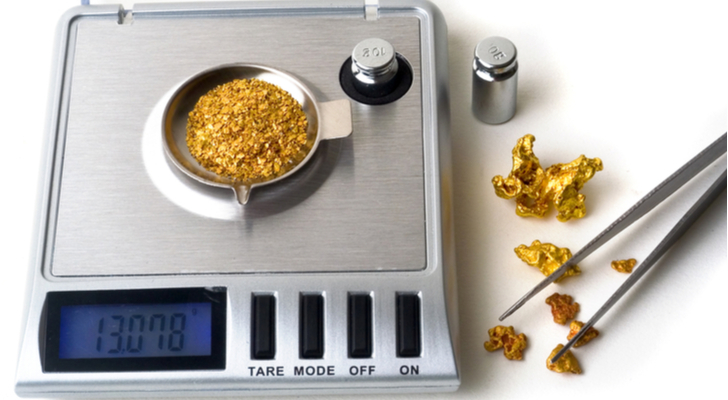 Gold stocks are percolating. And while much work remains before their long-term technicals turn bullish, the whole sector could be worth a trade here. I suggest letting the Vaneck Vectors Gold Miners ETF (NYSEARCA:GDX) be your guide. No matter how you spin it, GDX has been dead money for 18 months. Not that there haven’t been revival attempts. It’s just that each one was snuffed out before buyers could fully wrest control. With last week’s pop gold stocks have once again climbed above their 200-day moving average. Admittedly, moving averages have little worth in a choppy range. But the 200-day is currently providing a reference point for the midpoint of GDX’s range. So rising above it is worth noting. Moreover, gold mining stocks are outperforming gold. And that’s a bullish omen showing traders prefer a higher beta bet. Here are three gold stocks leading the charge. 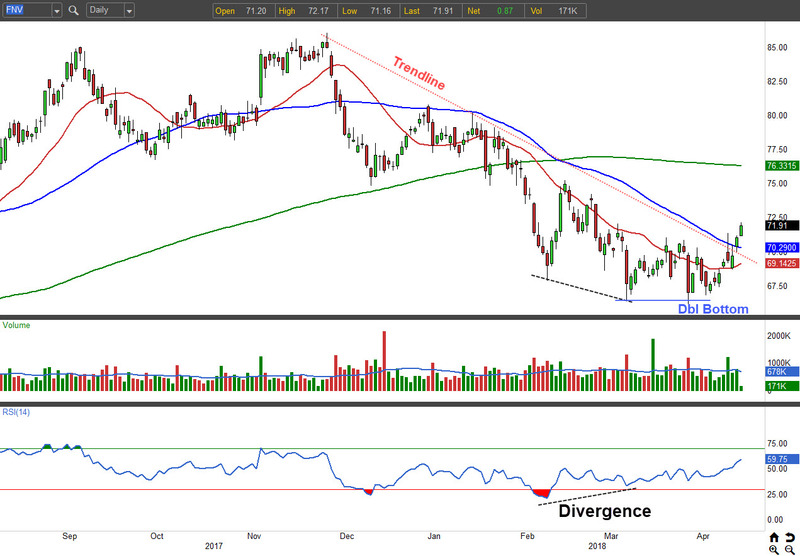 Newmont Mining Corp (NYSE:NEM) shares top today’s list with one of the best looking charts in the sector. With last week’s rally, NEM is fast approaching a new 52-week high. And it’s above all its major moving averages which are rising underneath. If the stock can take out near-term resistance at $42, we could see an eventual re-test of the $46 level. Volume patterns have been weighing in favor of buyers. Accumulation days aplenty have cropped up suggesting strong institutional interest beneath the surface. With implied volatility running hot ahead of the upcoming earnings release, option sellers are getting paid to take risk. If you think NEM remains firm over the next month, sell the May $40 put for 72 cents. Our next stock recently completed a bottoming formation. Last week’s dash for gold lifted Franco Nevada Corp (NYSE:FNV) back above its 50-day moving average and a descending trendline. The action preceding the break provides an instructive example of how downtrends often bottom. First, the lower low in March was accompanied by an RSI divergence signal suggesting the trend was losing steam. Then, we had a double bottom form further confirming sellers were losing their mojo. Last week’s climb potentially completed the bottoming process by vaulting above two clear resistance zones. While the reversal may fail, the price action in FNV looks better than it’s looked all year long. If you think the good times continue to roll, then sell the May $70/$65 bull put spread for $1.10. 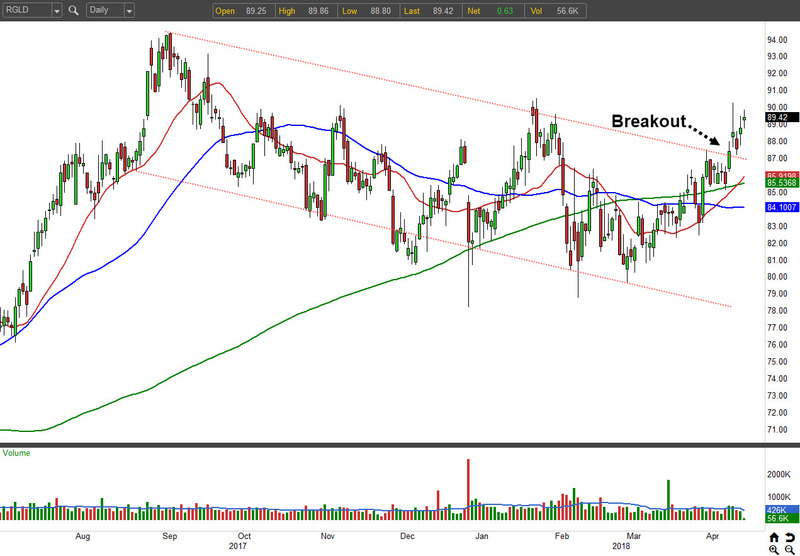 Since peaking at $94.39 last September, Royal Gold, Inc (USA) (NASDAQ:RGLD) has been stuck in a descending channel. On a positive note, the eight-month descent has been shallow, allowing RGLD to maintain most of the ground claimed in recent years. And this particular gold miner has come a long, long way. In 2015, this was a $25 stock. Last week’s pop finally ushered about the long-awaited breakout from its channel. Now, RGLD is poised to re-test the previously mentioned highs at $94.39. While the stock may pull back a touch to work-off its mildly overbought conditions, you should view dips as a buying opportunity. To bank on continued strength, buy the July $87.50/$92.50 bull call spread for around $2.40. As of this writing, Tyler Craig held bullish options positions in GLD. Want more education on how to trade? Check out his trading blog, Tales of a Technician. Article printed from InvestorPlace Media, https://investorplace.com/2018/04/gold-mining-stocks-waking-up/.